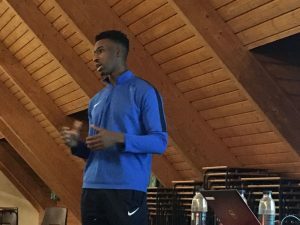 Yesterday both the IHM Ellesmere College and IHM Manchester city centre squads enjoyed a presentation by Tyrelle McLeod-Bentley from Soccer Assist USA. Tyrelle set out all the different options for playing top quality football on a college or university scholarship in the USA. It was exciting to learn how many US educational institutions offer young players the opportunity to fund their studies whilst playing soccer at the top level. For many young players this sees the launch of their pro football career. Tyrelle then watched and assessed the players in an eleven a side match which saw a team from each squad compete. 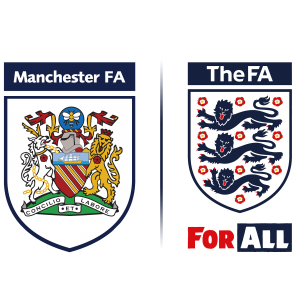 He was impressed by the level of football that he observed and has called back 5 Manchester and 2 Ellesmere players for a further scholarship trial. 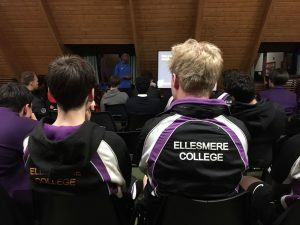 Following the game, Tyrelle gave an hour long presentation and Q&A on the routes into the USA and how he can work with players to help them to achieve that dream. We’d all like to extend a big thanks to Tyrelle for making the trip to Ellesmere College. 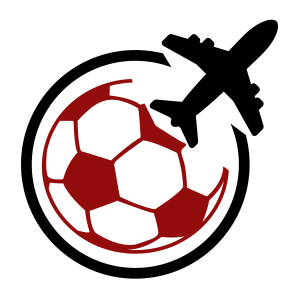 There were a number of players who were really interested in the US opportunity and we will be following up on this in the coming weeks. Watching some of the footage of the football in the USA that Tyrelle showed us demonstrates that it’s at a great level, and from what we saw in the game a number of our players could be really successful there. We wish them all the best.